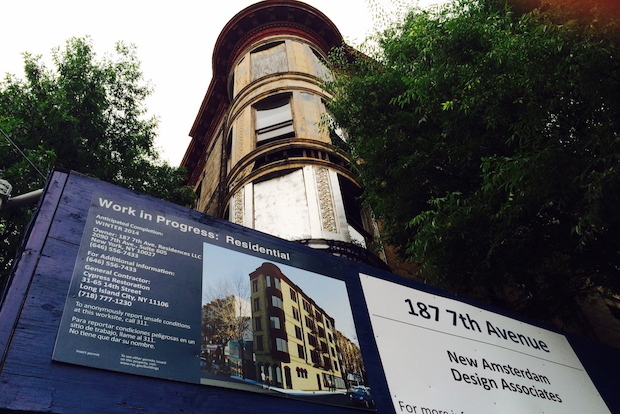 PARK SLOPE — A dilapidated, graffiti-covered Park Slope building is taking steps to be reborn as ultra-luxurious, massive full-floor residences — just like a building a block away where four-bedroom units were recently snatched up for more than $2.395 million apiece. Sugar Hill Capital Partners, the developer of the empty 5-story building at 187 Seventh Ave. at Second Street, that has long been considered a neighborhood eyesore, filed permits in April to convert the two apartments on each of its four residential floors into spacious full-floor units, according to Department of Buildings records. A rendering of the vision for the building's exterior was recently posted at the site that appears to show many of the structure's original features remaining intact. Project organizers said renovations are still in the early stages and that there are no available interior floor plans. "We are exploring all options at this point and are very excited about bringing excellent new inventory to the neighborhood," said Debra Bondy of Corcoran. The real estate company was tapped to market the project after Manhattan-based Sugar Hill Partners bought the reportedly 10,400-square-foot building for $4.2 million when the building was facing foreclosure, property records show. The team from Sugar Hill recently paid a visit to nearby condo the Bennett House at 582 Second St. near Eighth Avenue, where developer Ramon Maislen, of Brooklyn-based Phasa Development, has successfully created three approximately 1,623-square foot full-floor apartments by renovating six units, Maislen said. After only a single open house that drew more than 100 people, two of the newly expanded apartments put on the market last month went to contract for more than the $2.395 million asking price, Maislen said. He credits the level of interest to the lack of spacious apartments in the area. "I live in the neighborhood and recognized there's a need for family-sized apartments," said Maislen, whose own family currently occupies the third floor unit in the building. Maislen said the process was so successful he's planning another similar corner condo conversion in the neighborhood at an undisclosed address. "Not everyone wants a townhouse and the stairs associated with that," he added of the expanded units. "As someone with small children, I understand not wanting to worry about kids falling down the stairs or having to constantly run between floors." He also noted the full-floor layout gives the added advantage of allowing him to install 18 windows in each of these expanded units — more than the number of windows in many townhouses. "We have more windows in the master bathroom then most master bedrooms in townhouses have," Maislen said.